I ordered that off Etsy. The user name is "ChollaQueen". They are only 3 grams each but they say a little goes a long way. Hopefully the crabs actually eat it and not the Isopods. If that doesn't help with color I'm not sure what will. They also mentioned about adding Indian Almond Leaves in the water to make it into "black water". Briefly summed up the leaves will release tannins into the water. Then when the crabs drink the water they will be getting that too. I have yet to follow through with it but sounds like a good idea. I believe that discussion could be another post. I personally recommend leaving the leaves out of their water. Just give them the Catappa (Indian Almond) leaves to eat. Eating the tannin is better for them. I was thinking that eating leaves would be best too. Leaves seem to always disappear from the tank anyway, the crabs and isopods make pretty quick work of them. i'm sure they get drug into the sand and break down too. They already drag enough into the water on their own. There's no use encouraging them to do it more! 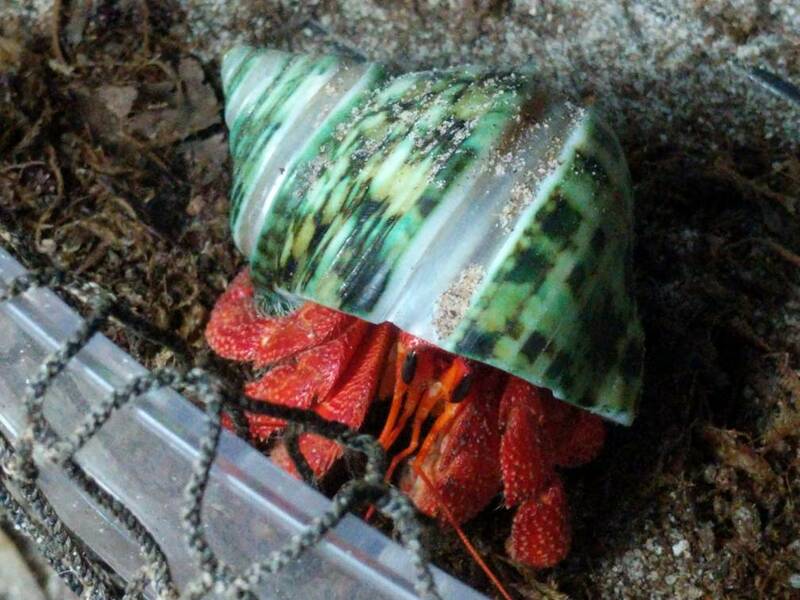 Im assuming that their color changes happen appear after a fresh molt like other hermits. Never slowly overtime. I just had Abby return up after being down since early December. I believe it was around the time I received all those powders. Abby does appear to be lighter this time. I believe this was her second molt for me since late July of last year. So far I believe Abby is the only one to molt twice. Diablo is currently down for his second molt. Expecting him up any day. The other three have only molted for me once that I recall. One may have just went down in the last day or two. You’ve got a lot of foods to help them, she should be able to make up for it in her next molt, right? I mean to get her coloring darker again. She’s such a beautiful crab, I want some straws after seeing yours. They are such gorgeous crabs! They will never be as vibrant as they are in the wild. As long as they don't have white on them you are fine. I haven't went through a molting yet with either of my 2 crabs....one of them (Scuttle) is very tan/pale color so i assume he didn't get enough protiens and things in the pet-store? I feed them lots of carrots and things like that so hopefully next molt shows a sucsessful (spelling ) coloration!!! Goodbye my little E. See you soon. Crabbing for over two years!